What you plant in your garden is solely up to your preference; however, if you are a novice you might not yet know what you prefer. Furthermore, you may want to put some thought and planning into your flower garden before you forge ahead because this saves you from making some mistakes. Planning your flower garden will ensure that the colors of the flowers you have planted don�t clash and plants that require lots of sun will get sun and those that need shade will get shade. If you do it right, something will be in bloom in your garden at all times during the growing season. In order to achieve these goals, you must know something about flowers, such as when they bloom; what their sun and water requirements are; what height they will ultimately be; what color they are and what type of soil is required. It might also behoove you to know in advance what flowers are or aren�t fragrant; which attract butterflies or birds and if they can survive intense heat or deep shade.The more you know, the greater success you are going to have. Some gardening businesses offer preplanned gardens which takes the guess work out of it for you. For example, if you want a shade garden the garden will include various hostas and phlox and other shade-loving plants as well as a layout guide, so you know which plants are tall and which are short and when the flowers bloom so you can plant accordingly. Preplanned gardens bloom throughout the season featuring complementary colors. Establishing a perennial garden takes a lot of work out of flowering gardening. A perennial flower or plant lives for more than two years and generally a lot longer than that. An annual flower or plant only lasts for a season and biennials are plants that require two years before they complete their biological life cycle. During the first year, the plant grows stems, roots and leaves and then it goes into dormancy during the winter months. The next spring or summer the plant gets longer and produces flowers or seeds or fruit before it dies. Biennials aren�t as common as perennial and annual plants. Even if you don�t have 100 percent success with your perennials -- some may die -- you will still have a jump start on your garden the following. It will already have some plants (perennials) in it when the growing season begins and you can work around them, adding more perennials and/or annuals. In other words, you aren't starting from scratch each year. Perennials generally live for about five years after they are first planted and most are hardy and resistant to insects and disease. An easy-to-care for perennial, such as phlox, is tolerant of growing conditions as well as of the heat of summer and the cold of winter. It doesn�t need to be staked and it�s not going to overrun your entire garden. Some easy to care for perennial flowers include day lilies, astilbe, bleeding heart, lady�s mantle, hosta, ornamental grasses and coral bells. Annuals are sometimes jokingly, but accurately, described as being comparable to a summer love: Live fast and die young. Annuals only survive for one season. They grow, flower, set their seed and die. However, they are quite beautiful during their bloom season. Annuals include geraniums, petunias, impatiens, marigolds, begonias, bachelor button, black-eyed Susan, snap dragon, salvia and zinnias, just to name a few. Spring perennials such as tulips, crocus, miniature blue hyacinths and daffodils are such a treat to see early in the spring, sometimes even when the snow is still on the ground (e.g., crocus.) It's as if they are heralding in the warm weather to come. You have survived yet another winter. Just hang it there. It will be summertime before you know it. Mums, which are perennials, boast wonderfully crisp colors, blooming in the autumn. They come in rich red, gold, white and purples and designate that the good weather isn�t going to last much longer. Winter is on its way. Look through some gardening magazines. Browse garden catalogs online. There are numerous seed, equipment and garden funiture catalogs that you can view. 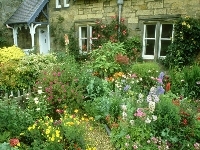 You can get some great ideas by seeing how others arrange their flower gardens. And, remember, there is some trial and error involved. In fact, there will be a lot of errors until you learn the gardening ropes -- but don't despair. You probably aren�t going to have a 100 percent success rate the first year out but you might. Do some research or talk to a flower expert and think about how you want your garden to look. Formal? Informal? Symmetrical? Random? Do you like vines? Roses? Shrubs? What about planting some trees? Will there be a walkway? A water feature? Gardening is hard work but it's also great fun and you are going to love experimenting with different kinds of flowers and plants and you will certainly enjoy the fruits of your labor.